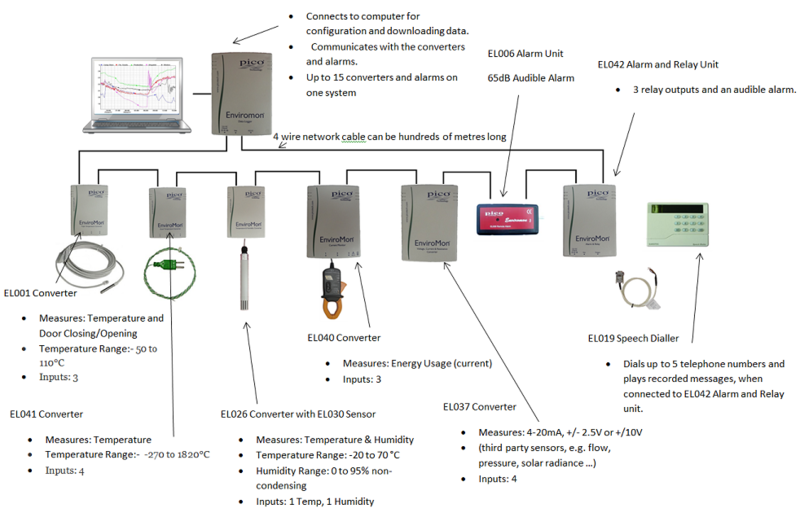 The EnviroMon product range from Pico Technology which has been designed to offer the best in Environmental Monitoring. It includes products for monitoring, data logging and acquisition of humidity, current, voltage, temperature recording and a lot more with our range of instruments. A 24/7 wired data logging and enviromental monitoring system from Pico Technology, the data logging system is configured on the computer and can then be left to run remotely or remain connected to the PC for live readings. Used in areas of environmental monitoring such as food storage, pharmaceutical storage, manufacturing process, laboratories or clean rooms, heat treatment and offices and to record over a period from weeks , months or even years. Pico Technology PC based data logging and acquisition products. These instruments require a PC connection at all times, they have no memory on board, the computers hard drive acts as storage. All devices have USB connectivity and some have Ethernet connectivity. Typically used for enviromental monitoring in research and development, calibration and testing, however can be used anywhere on short runs, typically lasting from seconds to days. Hand held instruments can act as portable temperature monitors giving instantaneous readings, or can be put into data logging mode where they not only display the readings on the screen but also record the readings in their on board memory, where they can be later downloaded to the computer. Typically used to do spot checks in a factory for verification, or can be used as a stand alone logger to record temperature readings in places where no computer or power is available. Typically lasting from seconds readings to weeks. How long are you looking to record for? – Are you looking to record for 1 hour, 1 day 3 weeks , 6 months or forever? How often do you wish to take a reading? – For example if your measuring temperature do you need to record the temperature every second, minute or hour? Or do you need to measure even faster? How many inputs are you looking for? – Are you looking to measure 1 temperature or 50? Do you require the data logger to be remote? – Do you want to leave the data logger in a remote location or do you have a computer nearby?